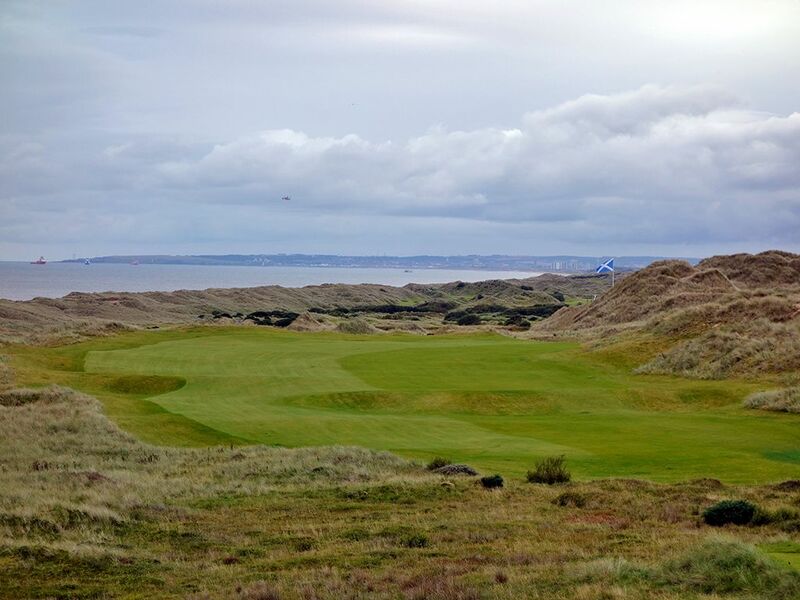 Course Website: Official Website - Visit Trump International Golf Links Scotland's official website by clicking on the link provided. 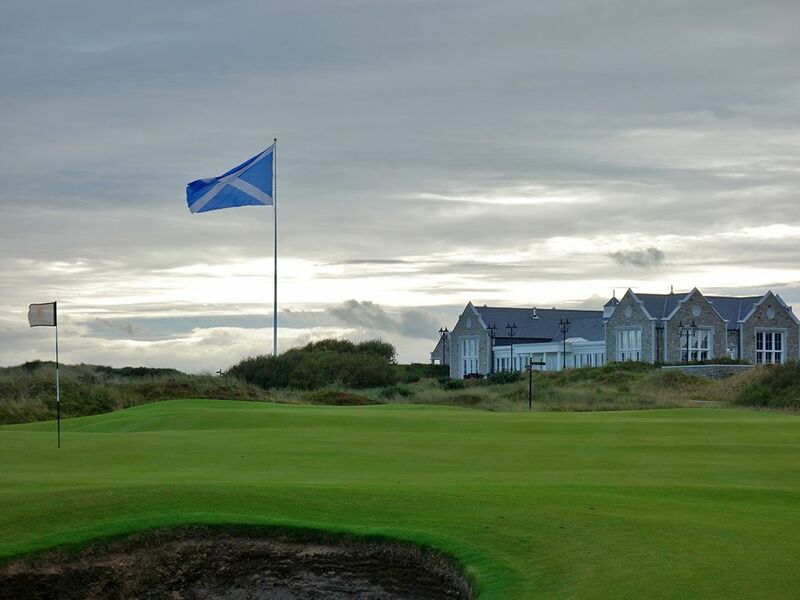 Accolades: Ranked 9th in Scotland by Golf Course Gurus. 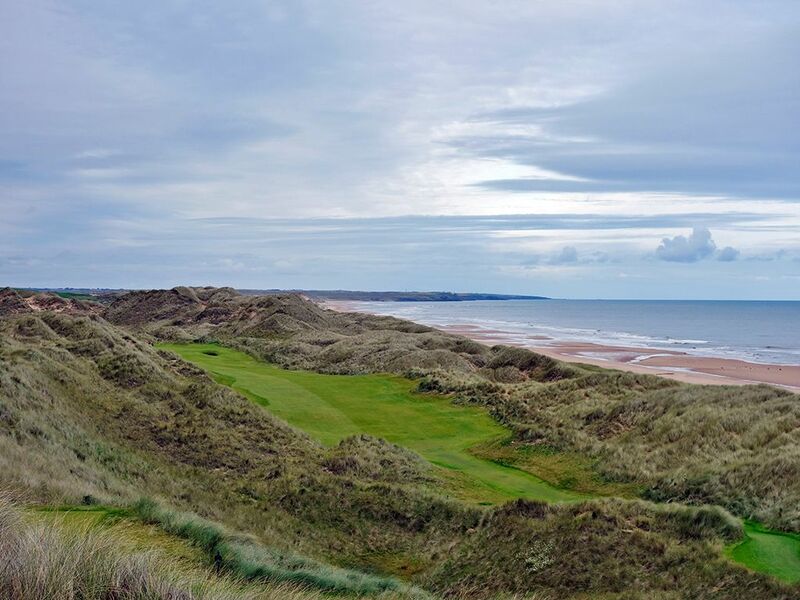 What to Expect: Few courses have opened up with more hype, anticipation, and controversy in the 21st century than the Donald's track north of Aberdeen, Scotland. 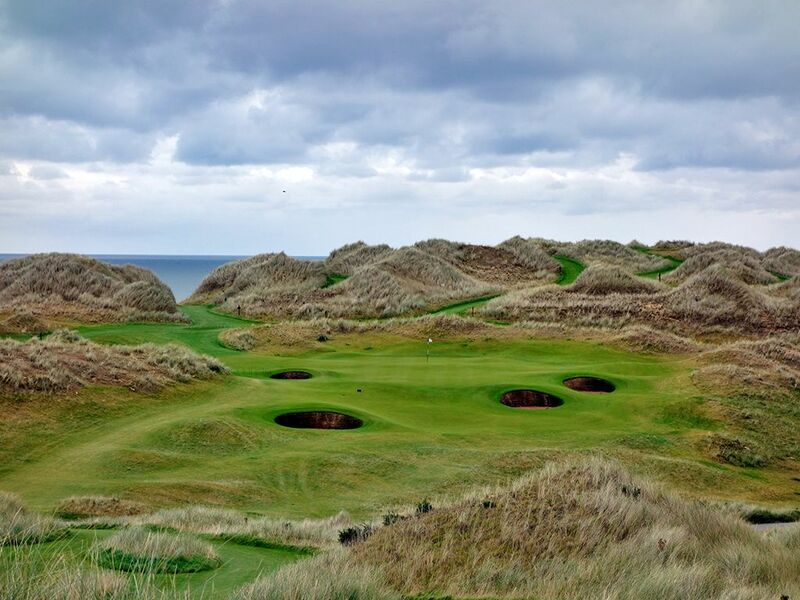 Set among some of the largest seaside dunes you'll ever encounter, Trump Scotland has a dramatic setting that Martin Hawtree capitalized on with numerous elevated tees which in turn delivers perhaps the most scenic golfing experience in Scotland. 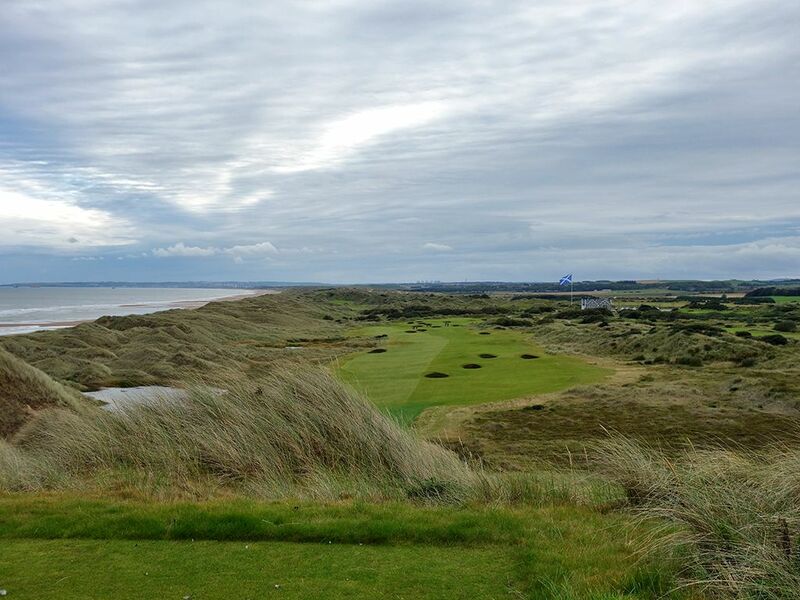 The course tips out as one of the longest courses in the UK which is partially a product of Trump's desire to host an Open one day; something that likely won't happen. 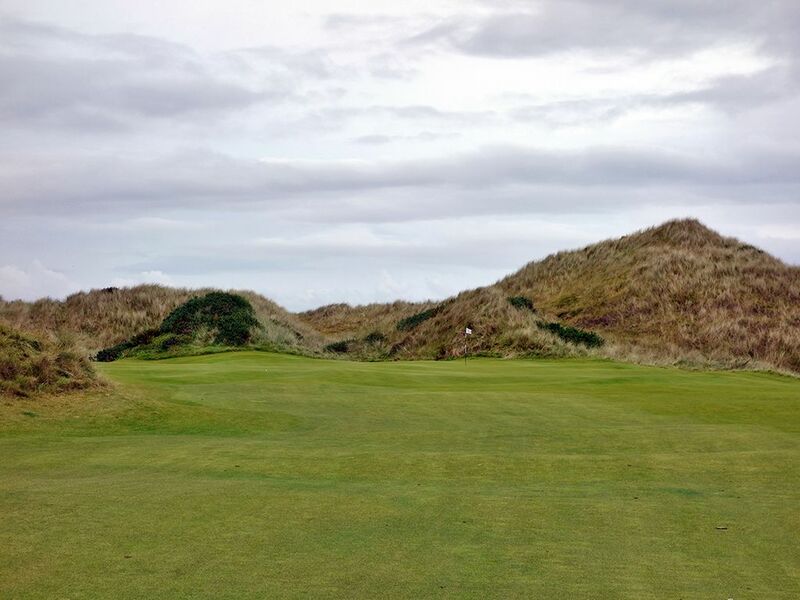 Comparisons to Trump's Doonbeg golf course in Ireland are natural as the setting and vistas have similarities with marram grass covered dunes framing the holes and the ocean setting one of the property boundaries. The fairways are wide which is a welcome feature considering the often windy conditions and penalty associated with leaving the short grass. From a conditioning perspective, the course is kept in great shape with a sizable crew working hard to make it one of the better turf experiences in Scotland. 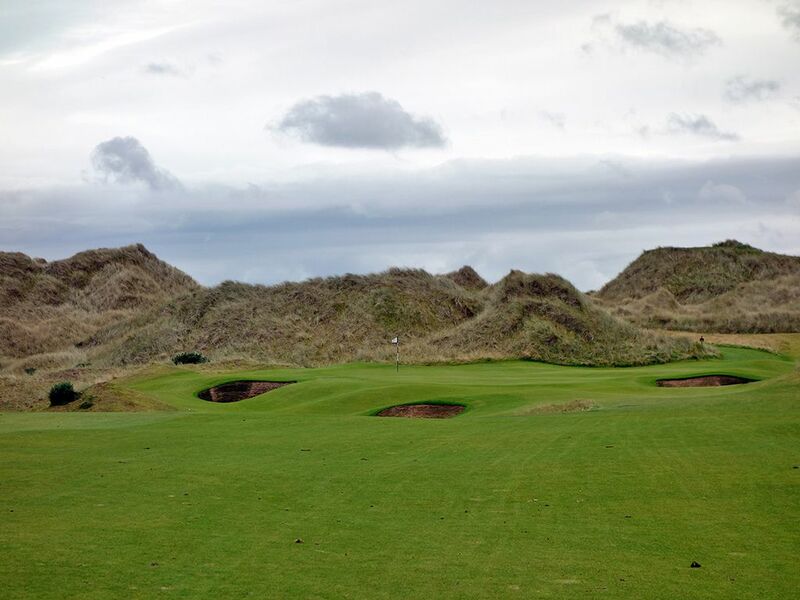 Individually there are several noteworthy holes at Trump Scotland and plenty of opportunities to use your camera, but the overall flow of the routing is clunky due to the excessive number of hikes to reach the back tees and overall distances covered from the previous green to the next tee. 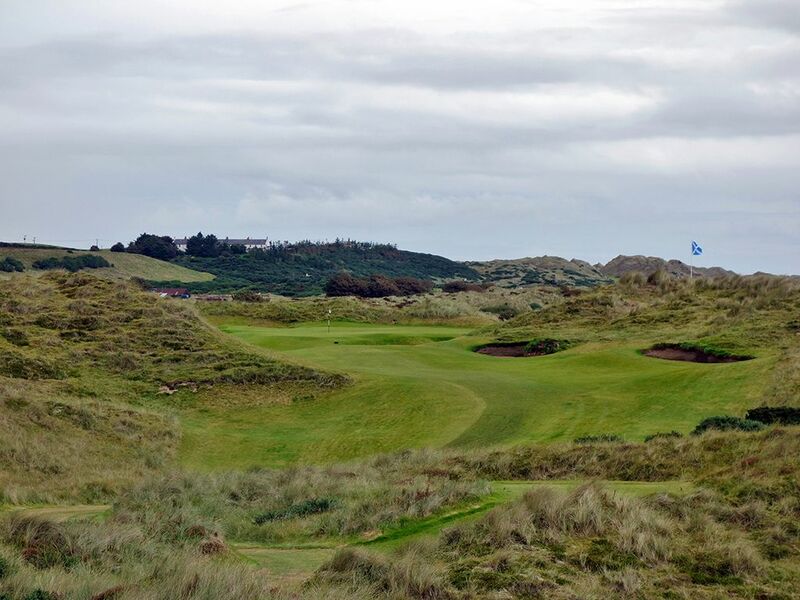 The height and thickness of the marram provides a nice contrast visually, but is brutal from a playability perspective. Hitting a ball outside the fairway is a sure fire way to require a reload since finding your Pro V1 will be an adventure worthy of a jungle safari guide's assistance. In addition, the walking paths are carved through the marram grass covered dunes and the plethora of tee boxes results in a labyrinth of paths to pick from to get to the correct. While there are signs with arrows guiding you where to go, they aren't always accurate since the tee markers are adjusted daily. Perhaps the most challenging feature at Trump's Aberdeen course is around the greens where the putting surfaces are often elevated and feature sloping edges with short grass which results in a lot of approach shots being repelled into a bunker or back down the fairway. So while the square footage of the greens is nicely sized, the effective landing area shrinks up pretty quick. While the front nine is commendable in its own right, the back nine is what most golfers will walk away remembering with holes 12-14 being particularly impressive and representing as one of the most inspiring three hole stretches in Scotland. The ascent up to the 17th green followed by the panoramic view from the back tee on #18 is flat out impressive and was clearly reserved for the end of the round intentionally. Ultimately I have mixed feelings about Trump Scotland. Visually the course is impressive, there is little argument against that and there are some holes I really enjoyed. The flip side is that the experience could be absolutely punishing in windy conditions, or if your driver is squirrely, and the walk feels more like work than enjoyment. I see Trump Scotland as one of those courses you want to experience once but may not make the itinerary for return visits to golf's homeland. Signature Hole: 14th Hole – 445 Yard Par 4 – At a course where elevated tees and stunning views are the theme, the 14th stands apart as the course's finest and is simply inspiring. 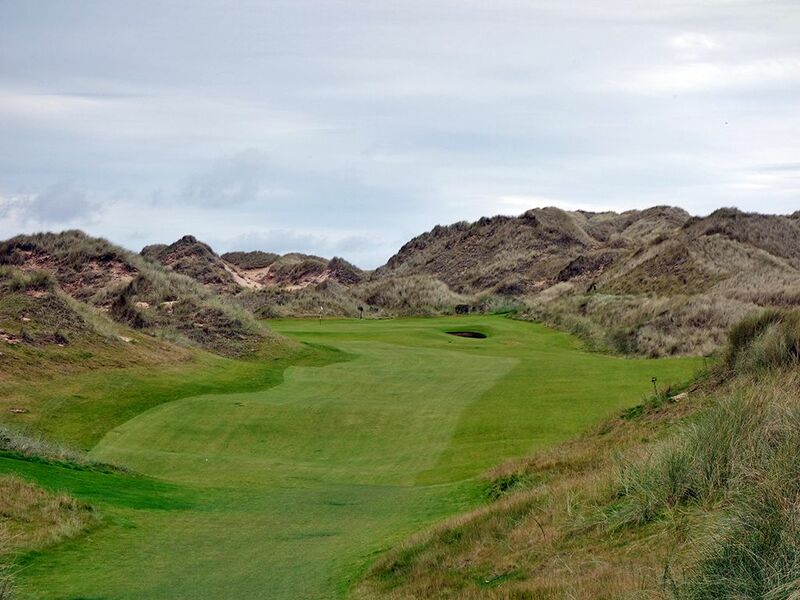 The tee shot descends to a fairway that ribbons through a valley of mighty dunes with the beach and North Sea creating the right boundary beyond the marram grass. There is more forgiveness in the fairway than might appear from the lofty tee, but in a wind there is no doubt that the intimidation factors notches up. The green is slightly raised with sloping edges and is protected by a lone bunker on the right side. This has to be one of the first holes Hawtree identified when coming to the dramatic site that Trump Scotland sits on. Best Par 3: 13th Hole – 229 Yards – An inspiring hole awaits at the 13th as players are turned to the east and play directly towards the North Sea. 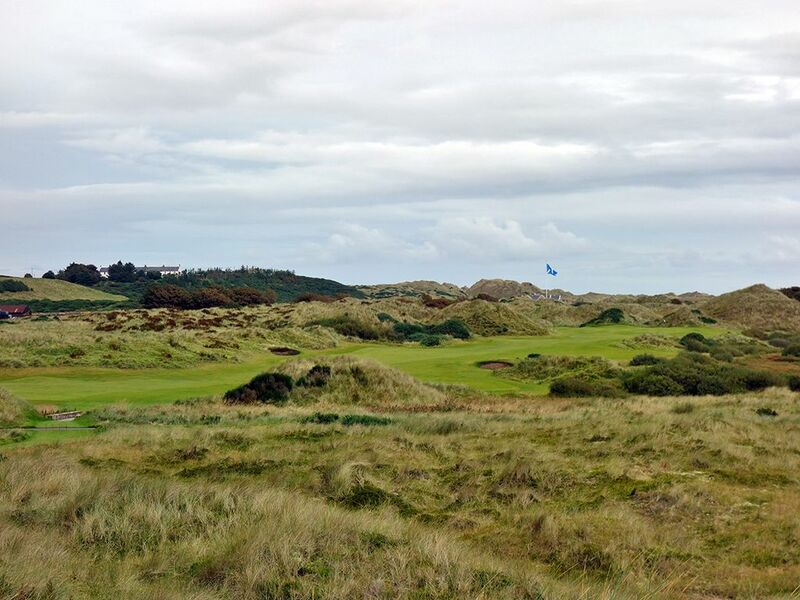 Stout in length, the 13th requires a well struck ball to reach the green that sits at the base of some dunes before cascading down the front towards the surrounding marram grass. Four sod stacked bunkers add an element of difficulty to the hole, especially if your ball finishes near the tall face. Par here is a very gratifying accomplishment. Best Par 4: 12th Hole – 435 Yards – One of the best three hole stretches in Scotland begins with this par four and unveils some of the grandeur you'll experience at Trump Scotland. The elevated back tees provide an impressive view of this dogleg right with the North Sea creating the visual to the left. The lower tee aren't elevated but provide more protection from the prevailing wind that is in your face. The wide fairway allows you to grip it and rip it with plans of clearing the four grass bowls that necklace across the fairway 215 yards away. The approach shot plays to a green elevated ten feet above you and is protected by a triangle of bunker with the "point" bunker sitting 20 yards short of the putting surface and the other bunkers hugging each side. The tee and approach shot combination here is nothing short of fun to execute. Best Par 5: 18th Hole – 651 Yards – Like everything Donald does, the closing hole at Trump Scotland is "huge!" At 651 yards, it stands as one of the longest holes in Scotland and the ascent to the back tee is an adventure both for your quads and your camera. The commanding view features the North Sea to the left with a pair of ponds sitting in the dunes between the sea and the fairway while the fairway itself is dotted with bunkers that move from left to right across the short grass. An astonishing 18 bunkers come into play enroute to the home green and frankly are more of a distraction than a strategy, but Donald is always known for going over the top. Regardless, it is a climatic conclusion to a course full of dramatic features. Birdie Time: 7th Hole – 281 Yard Par 4 – On a course that tips out over 7400 yards you wouldn't expect a sub-300 yard par four on the scorecard, but that is exactly what you get here. While the length makes the green plenty reachable, the smallest green on the course can be tough to hold consider the raised putting surface and deep swells around it. The likely play is to bang a drive up near the green and then use your deft short game to chip the ball near the hole for a kick in birdie. Virtually any tee shots that avoids the two fairway bunkers and stays out of the marram grass outside of the fairway should be in good shape for going pinseeking on your approach shot. Bogey Beware: 8th Hole – 500 Yard Par 4 – I hope you took advantage of the easy 7th hole because you are now at the most difficult hole on the course. If 500 yards wasn't enough to cover in four strokes, bunkers sit on each side of the driving zone to contend with and will instantly take par out of play if you end up in one. A dune partially blocks the view of the fairway from the back tee and encourages players to hit their tee ball to the left where their eye can see fairway, but this only stands to lengthen the hole as it eventually turns to the right and away from players. The daunting approach shot plays uphill to an undulated green that almost adds insult to injury by yielding its fair share of three putts. This hole is a brute, there is no way around it.